The great thing about the series is that you don’t really have to have read the previous books. The novels can easily stand on their own, although I find that the story is more meaningful with the full backstory. I picked up my copy from Armchair Books in Whistler earlier this year as the novel was published January 29, 2013 in Canada. 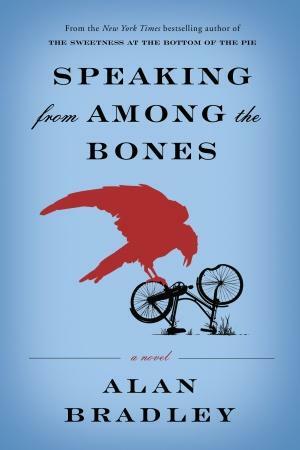 In the fifth book of the New York Times bestselling series, featuring Flavia de Luce, Alan Bradley pens his most chilling mystery yet, and introduces a new character into the mix whose actions will have lasting consequences on Bishop’s Lacey, the de Luce family, and especially Flavia herself. When the tomb of St. Tancred is opened at the village church in Bishop’s Lacey, its shocking contents lead to another case for Flavia de Luce. Greed, pride, and murder result in old secrets coming to light–along with a forgotten flower that hasn’t been seen for half a thousand years. As you can probably tell, I adore the character of Flavia and always enjoy reading her adventures. Each novel has us learn to more of the characters in Bishop’s Lacey, as well as some that we’d already encountered. Inspector Hewitt plays a very small role in this book, and backstory about the de Luce family becomes more important. Even though there has been a murder, the book is light-hearted and easy to read, like a cozy mystery as opposed to a high-suspense thriller. Flavia is a witty, intelligent, and humourous narrator and even though she is still only 11 years old, she has matured since the first book. This maturity is especially evident in her interactions with her sisters, Ophelia and Daphne (or Feely and Daffy as she calls them). I find the Buckshaw Chronicles (aka the Flavia de Luce series) enjoyable and entertaining. Even if they’re slightly fluffy, they are well-written and it’s easy to get absorbed in the story. And now I’m itching to read book 6; even though they solved the murder, the book ended on a huge cliffhanger! The Dead in Their Vaulted Arches will be published January 14, 2014.